HISTORY...Jacksonport became a community in 1869. It is named after a gentleman by the name of Andrew Jackson who came to log the area from Madison. PLACES TO VISIT...Jacksonport’s Lakeside Park located smack dab in the middle of town is the setting for the Town’s many events. The New Year’s Day Polar Bear Plunge begins the year’s events. The next is Jacksonport’s annual Maifest held Memorial Day Week End. Plan to get your fresh veggies on Tuesday’s Farmer’s Market held during the growing season. For great food, Bob and I enjoy J&J’s of Jacksonport and Mike’s Port Pub. 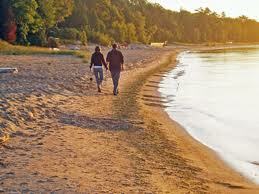 Fabulous parks to visit in this area of Door County include Whitefish Bay Dunes State Park and Cave Point County Park. You'll also enjoy some of Door County's finest beaches. in Door County. SEARCH DOOR COUNTY REAL ESTATE FOR SALE IN JACKSONPORT!